This last week, I traveled to Orlando, Florida with our Wing's Inspector General team for the Air National Guard Inspector General Management Summit (AIMS) Conference. I've been working in the IG office since March 2018 as their Wing Planner. I'm transitioning out of their office and into a solo permanent position as our Wing's Information Protection Officer (aka our Chief of Info Protection, the CIP), so I was fortunate that the IG office asked me to go with them on this trip. I'll still be helping their office out with big exercises and inspections, so this was a great trip to enhance my learning and hone in on some more training. We got to Orlando on Monday, with the conference going Tuesday - Thursday. We checked in to the Florida Hotel and Conference Center (it was really nice!) and enjoyed some Mexican food and brews at two local spots while we watched Monday Night Football. The next three days, our conference was slated to go from 0700-1630. 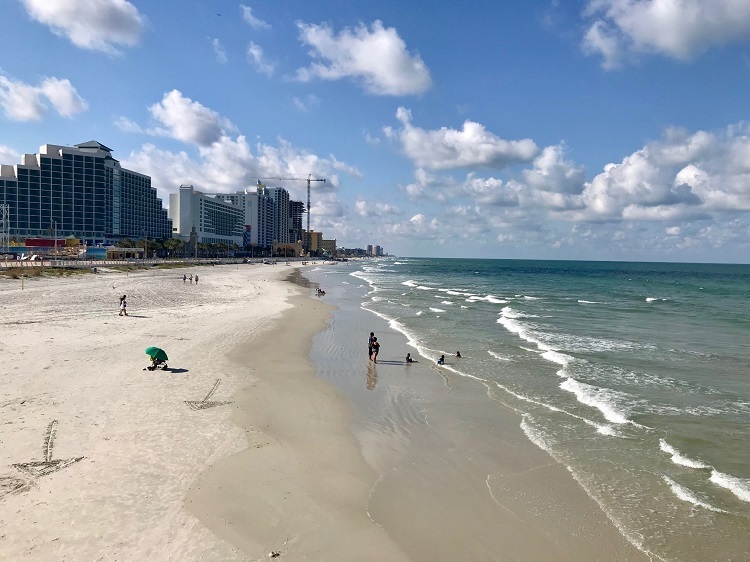 Orlando has a ton of stuff to do, but it's also about an hour away from surrounding beach towns, so that was the plan almost every evening after the conference. The coolest part of this conference was that Daniel got to go with me! He had a bunch of extra leave to use, so he flew down to Orlando with me and was there all the way through Wednesday. We turned my work trip into a mini spontaneous vacation after each day's conference was over, and it was the best way to spend the week. Tuesday while were in the conference, he went hiking at a local spot and then when we got out, he and I headed over to Cocoa Beach. The beach was gorgeous! It was a nice little town, filled with condos and hotels and a couple hot spots to sip on cocktails and enjoy some delicious seafood. We spent some time down at the beach by the pier. It was the perfect temperature and the water was so nice and warm! 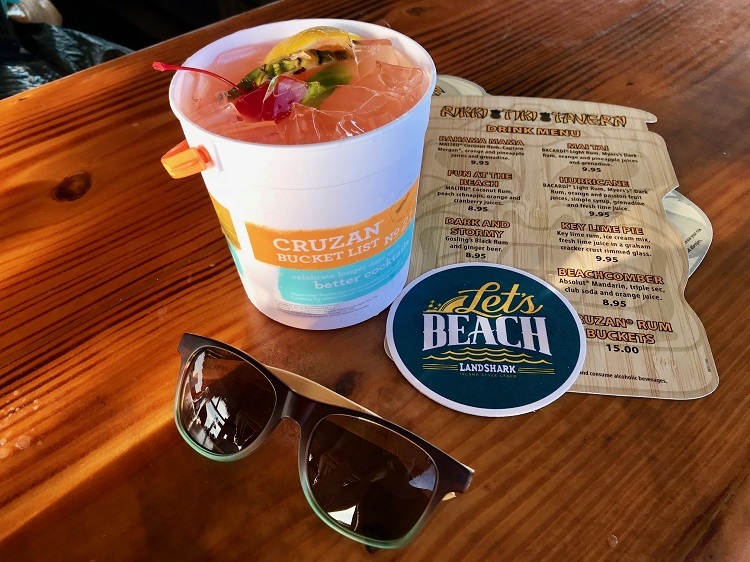 After looking at reviews of the most popular places in Cocoa Beach, we wound up at the Rikki Tiki Tavern which is out on the very far end of the pier. It was an amazing spot (with yummy cocktails! ), and we spent quite a bit of time there just enjoying the afternoon and meeting some new friends. Cocoa Beach was an absolutely beautiful place. The weather was so nice, and it was just a short hour's drive from Orlando. We were so glad we went there and are thinking about planning a real vacation back to enjoy more of the town in the future. On our second day, we spent our conference lunch break at the Havana Bistro and Café next to the Florida Hotel. It probably looks just like a simple plate of Cuban food but OH MY GOSH it was good! 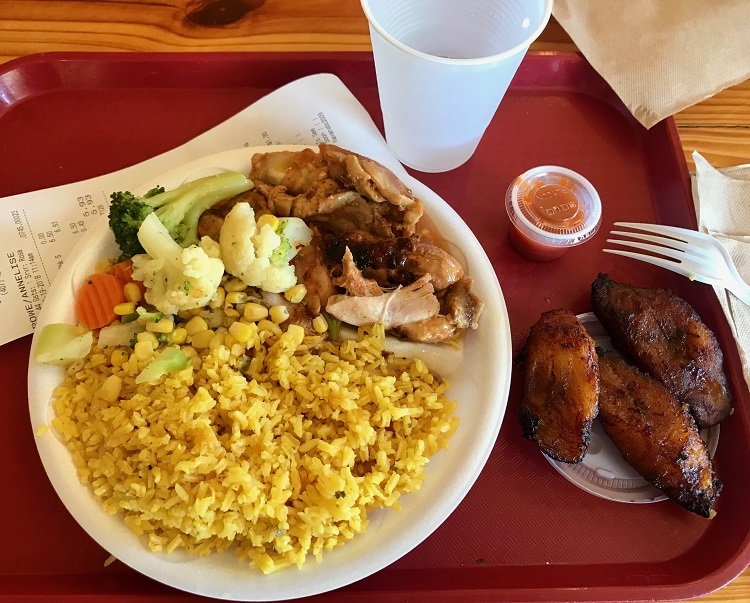 I have never had Cuban food before, and that entire plate was only $7.00... the chicken and rice melted in my mouth. Had to share! 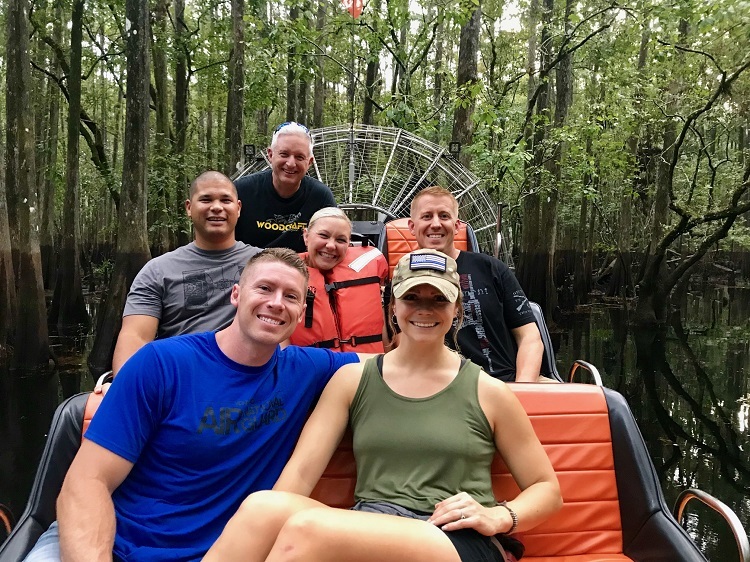 After the conference on Wednesday, we drove an hour over to the St. Johns River to take a ride on Capt Duke's Airboat Rides. Talk about the best $50 I've ever spent... it was a 90-minute ride through the Florida swamps and we saw the craziest and coolest things! I've never been on an airboat, and I'm not only in love with the experience, but it was literally the most awesome thing we did in Florida. We saw alligators (hundreds of them! 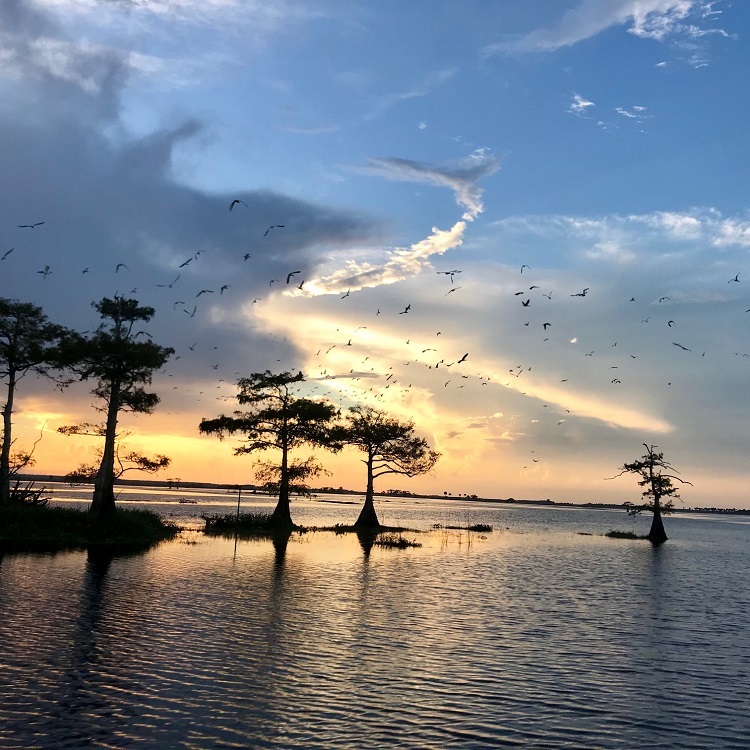 ), water snakes, pink birds, giant hand-sized spiders (didn't share those photos--you're welcome), an amazing sunset, and learned all about the history of the St. Johns River. 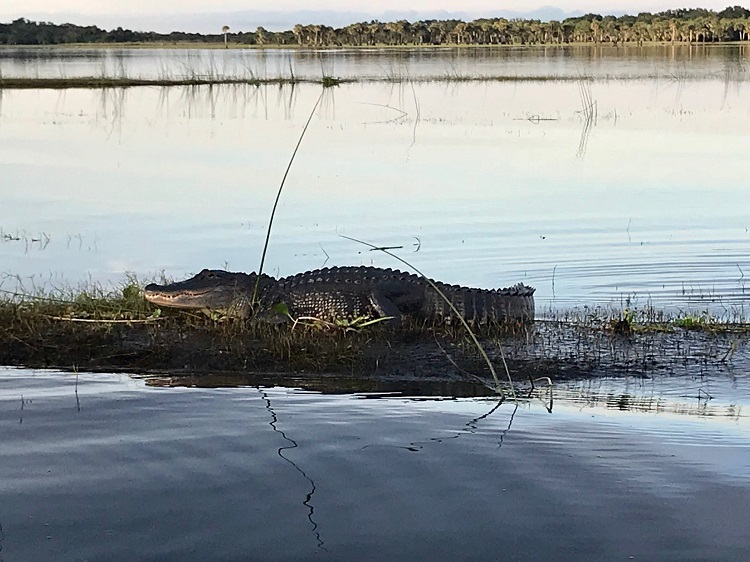 This was one of the big alligators we saw on the airboat tour. There were hundreds of them out there, big and small. 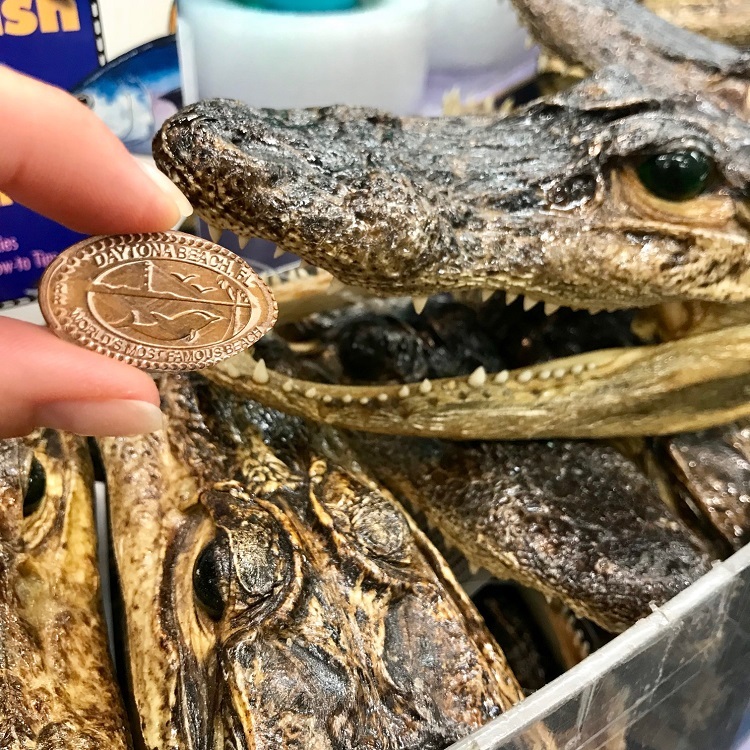 We got pretty close to some of them, but I would have loved to have been able to have a Lake Placid-esque moment with one of them--without being eaten, of course--that would have been so cool! The swamps of the St Johns River. The waterline that was permanently marked on the trees was incredible. There are huge Huntsman Spiders that live on those trees. We saw one that was the size of my hand! I'd have gotten closer to it if I'd have been convinced it wouldn't bite me. 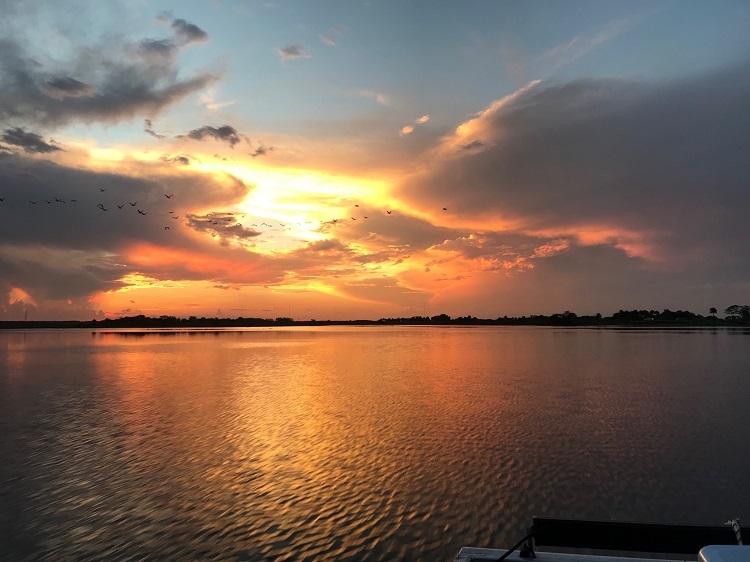 Amazing sunset and bird fly-over on the St. Johns. We stopped at a little island so Capt Duke could tell us some of the history of the area. 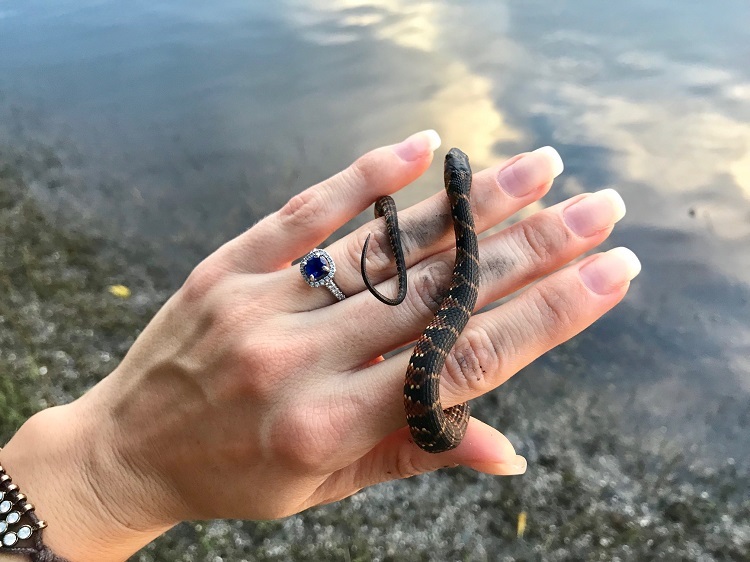 While we were walking around, we stumbled upon a little water snake. I bent down and snatched him right up! He was a nice little guy (not poisonous), and I held on to him for a while. I would have taken him home if I could! The ride with Capt Duke was our favorite thing we did on the trip. 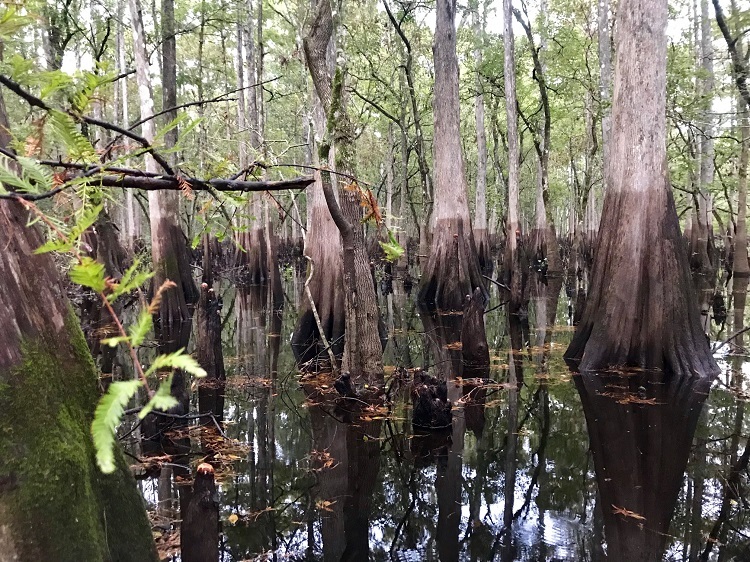 It was a 90-min ride through the swamps and was the most incredible experience. I'd do it again in a heartbeat and can't recommend it enough! Wednesday night was Daniel's last night in Orlando, and this was truly an amazing way to cap off a short and sweet vacation. 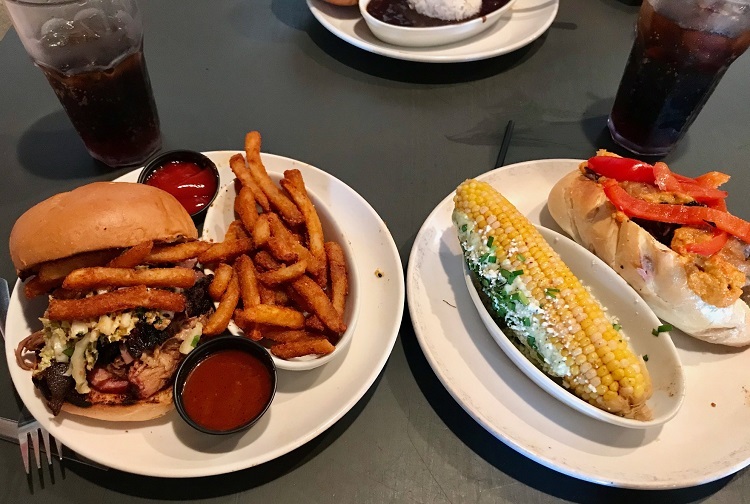 On Thursday after the conference ended, the rest of us went to Pig Floyd's Urban Barbakoa in Orlando before heading to Daytona Beach. Their BBQ was to die for. 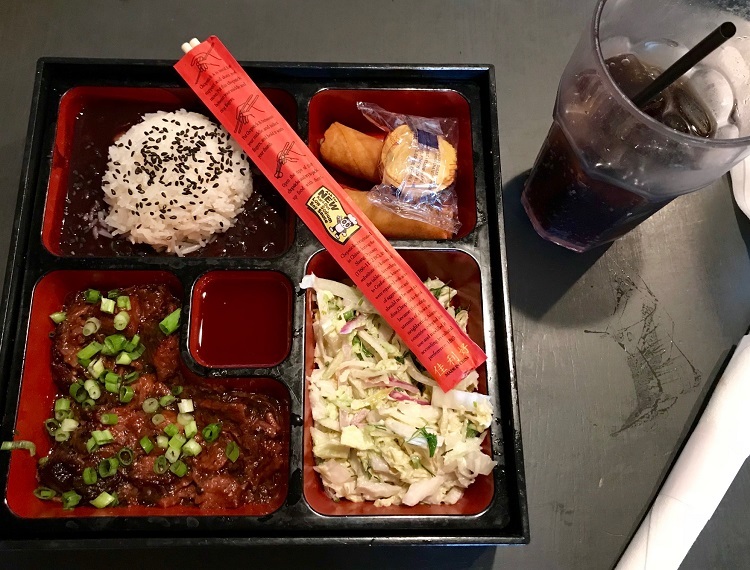 The guys got brisket and pulled pork sandwiches, and I got a brisket bento. Holy cow that place was good! Daytona Beach was an hour's drive from Orlando, and it was surprisingly empty. I've heard so many stories about Daytona and how it gets just packed during spring break time. I was anticipating crowds of people, busy storefronts, lines of people waiting to get in to the most popular restaurants, and beaches teaming with crowds. However, none of that was the case. It was pretty much deserted, so we felt like we had the beach mostly to ourselves. We walked up and down the beach, wading through the water, and found our way down to Sloppy Joe's for some cocktails before dinner. We explored the streets of Daytona, pretty much the only people out there, and just walked and walked all evening. 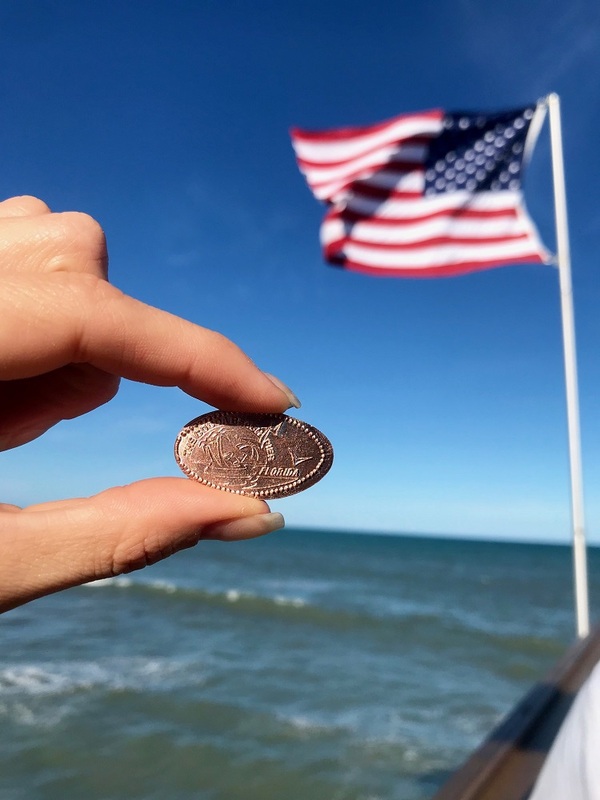 I found a penny press in a tourist shop! Had to snag one for my collection. As we were headed back to the car, we got sidetracked at Screamer's Park, which boasted a Sling Shot ride, the Vomatron, and a big Jenga puzzle. I got suckered in and had to ride the Vomatron. I love thrill rides and this one was very, very fun. 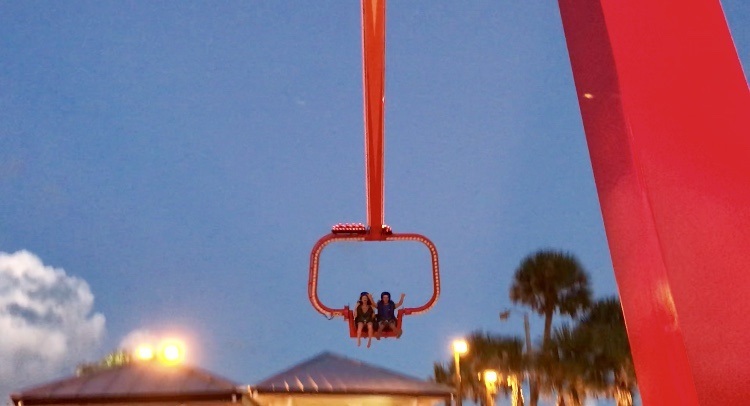 I hated that I paid for it, but loved the feeling of zero gravity and flying high above Daytona Beach. That was a fun memory for sure! We headed back to Boise the next morning. The entire week was such a cool departure from the norm and I had so much fun exploring somewhere new. I've been to Orlando before to go theme-parking at Disney and Universal Studios, but this was an entirely new experience. 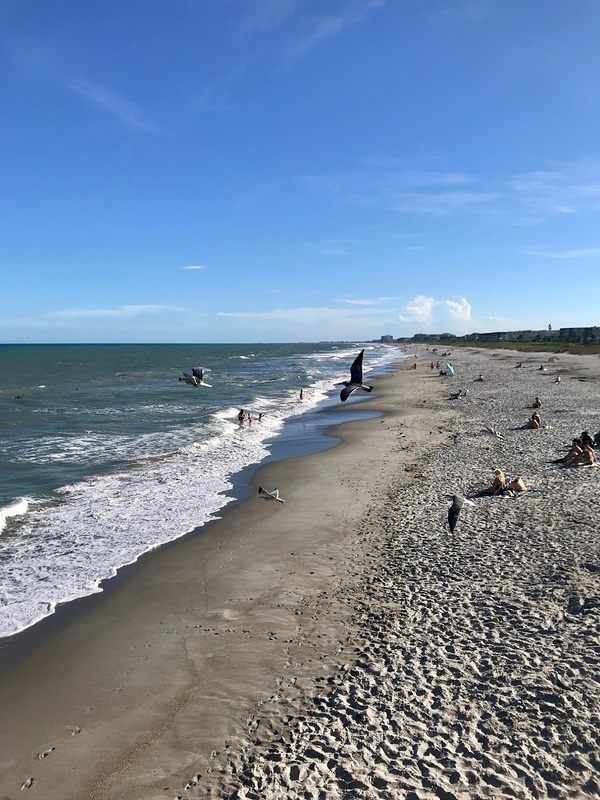 I loved visiting the beach towns, eating all the best-rated local food, and spending time with my husband and coworkers outside of our hometown. I was so fortunate to have been invited on this trip, and not only did I learn a lot, I also really enjoyed the time outside the conference that we turned into a mini-vacation. I've been so lucky to be able to travel for work and to get to see all different sights and states in the US. I knew I'd travel and explore when I joined the Air National Guard, but I never expected to travel so often, enjoy the TDYs so much, and to be given the most amazing open doors with each new opportunity. I love my job lately and couldn't be more grateful to finally have a permanent position within the ANG. This military life is goooooooood!